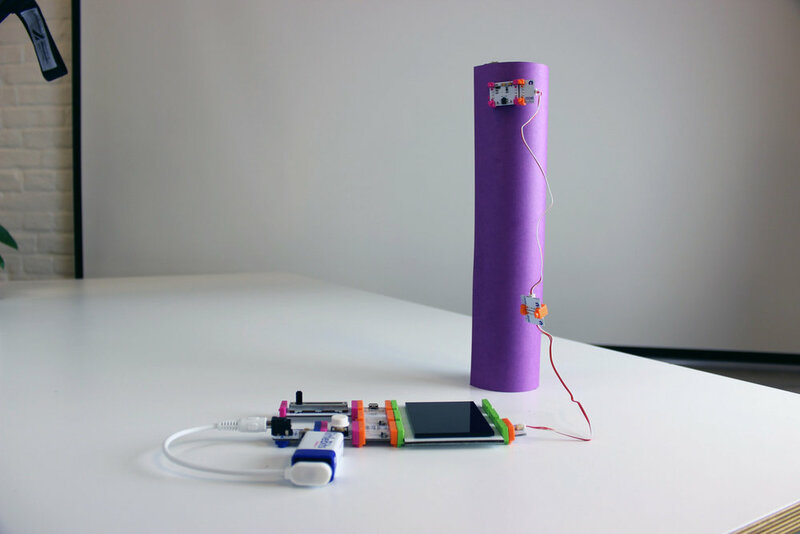 A vision for littleBits' first product to mix software and hardware. A kit for building electronic games and learning about programming. 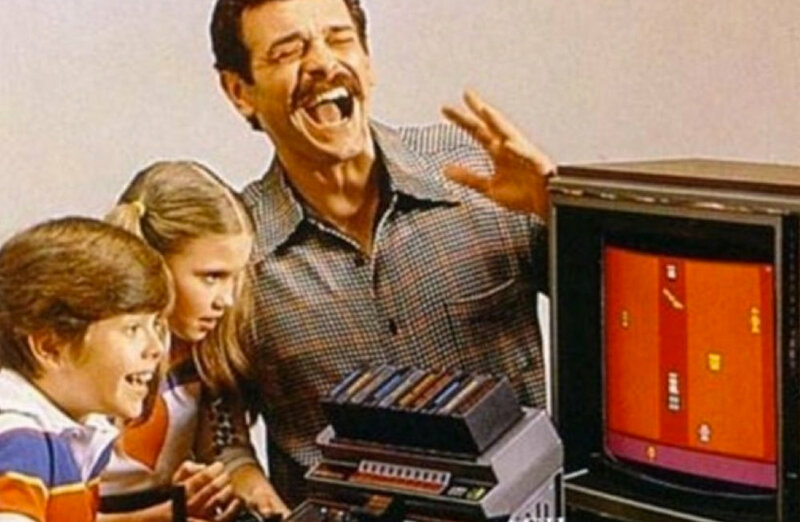 Design a kit for parents and kids to build and play games from the 8-bit era. This became the slogan for our concept and the most important design principle we recommended to the littleBits team. When we started working with their team the vision for the product was akin to a build-your-own-Gameboy. 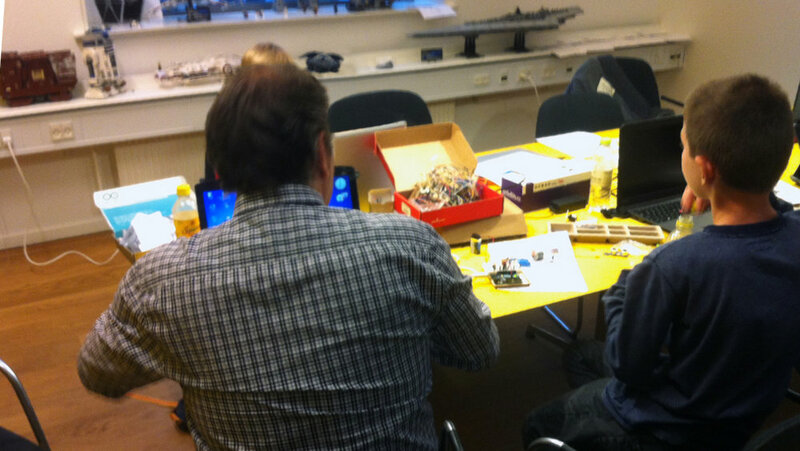 Over the course of the project, we immersed ourselves in the littleBits universe and in the world of gaming. In the end we designed a kit that gives kids and their parents the power to free the 8-bit games of yesteryear from screens and bring them into the physical world where they can become something completely new. Getting familiar with game design at a retro arcade. 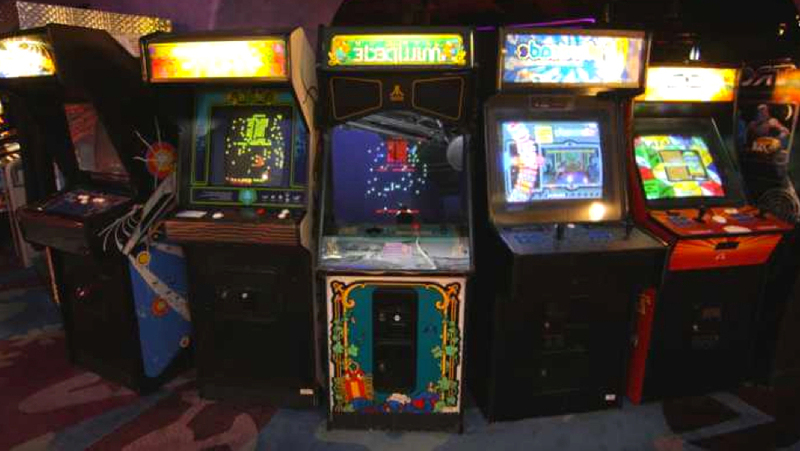 One of the biggest insights from our team research trip to a local retro arcade was noticing that many of the games were slight tweaks of each-other. By changing a few small things about the game or controller you could have an entirely new experience. Co-creating with kids to understand how they think about video games. We ran a co-creation session with four 10-13 year olds. We brought a hacked together littleBits controlled video game and some vintage handheld games. We used these to spark answers to questions like: If you could build your ultimate controller for your favorite game what would it be? Sitting in on a kids coding club to see their skill level. We visited a Copenhagen based coding club, Coding Pirates, to help us get a better sense of what sort of game complexity 10-15 year-olds would be capable of coding. Littlebits’ products take something very complex, electrical engineering, and distill it down into understandable blocks. They are abstracted away from concepts like resistance, current, analog, digital, etc. and presented simply as what they “do”. The same approach can be applied to video game elements. Littlebits are about enabling new experiences and one-of-a-kind creations. The gameplay of the kit should not mimic an existing product such as a gameboy. It should give kids the tools to create new games that play out in-between the real world and what’s on the screen. Learning to code often starts off by learning to make changes to existing code. The same can be done with games. 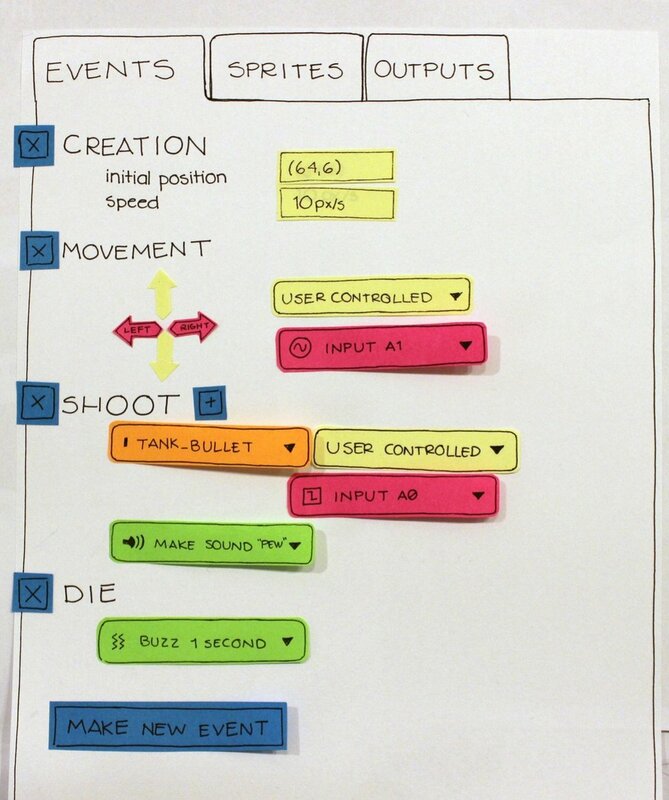 Use tweaking things like sprites, speeds, and game-boards as a gateway to more complex game building. It’s important to allow kids to see how their changes affect the gameplay in real time. The Atari-style game format and 128 x 96 pixel screen requested by the client had major implications for how we designed the game building environment. The pixel density and complexity of the games meant that, for simplicity sake, we needed to add an additional layer of abstraction on top of the traditional object oriented programming norms. 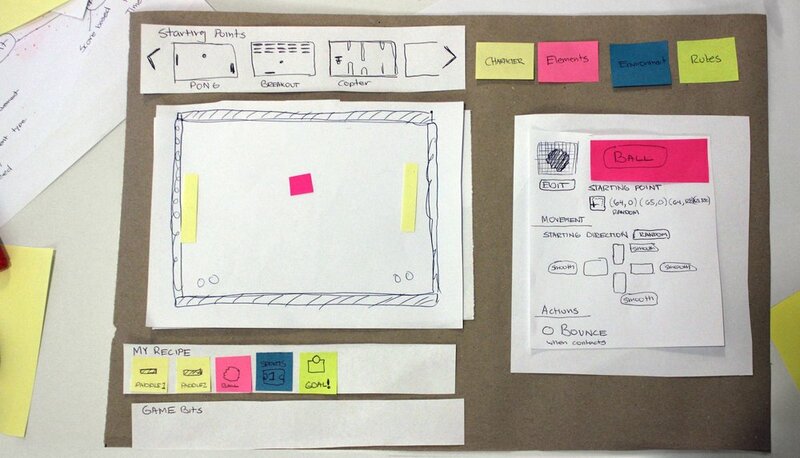 We called this layer “Game Blocks” and built the interface around this concept. Just as the physical littleBits blocks are ingredients in a recipe for circuits, Game Blocks are ingredients in a recipe for games. They fall into the categories Characters, Elements, Environments, and Information. The physical blocks have a can’t screw it up principle. This means no matter how you assemble two blocks you can’t break anything. The same goes for the Game Blocks. Each block is self contained with it’s own behavior and visual style. This means you can drop any block into your recipe and see how it behaves. It may not work well, or even be playable, but you're never left with compiling errors or debugging. Just try a different block, or start tweaking the blocks attributes in the Block Editor Interface. A collection of blocks designed to spark physical play. In choosing what littleBits blocks we wanted to include in the game kit we intentionally included "wildcard" blocks not usually associated with video games. For example the light sensor block turns a helicopter game you could play on any phone into a Kinect-like controller where your hand "becomes" the aircraft. To illustrate our "Everything is A Controller" concept we mocked up examples of physical controller projects that would be built to accompany the on screen games. The Enemy Spawning Tube allows a second player to introduce new enemies into the gameplay happening on the screen. A Motion Trigger block is placed at the top of a paper towel roll. When player 2 wants to spawn a new boss enemy into the game they drop an object into the tube setting off the trigger and telling the game to create the new enemy. The Gum-ball prize machine project brings the arcade experience into the home or classroom. 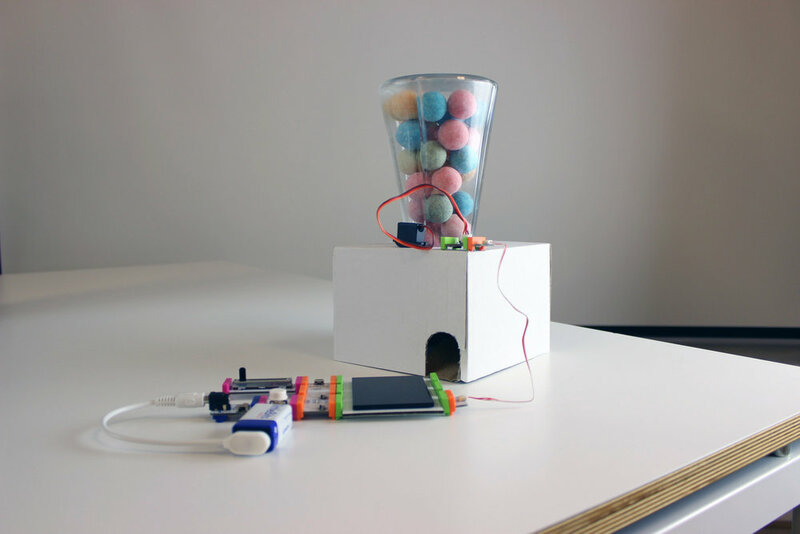 Pair a littleBits servo block with a jar, cardboard box, and some candy and you've created a tasty reward for any game. Tweak the game to trigger a reward at a high score or at the completion of a level. This project introduces the idea of physical outputs. If a servo can trigger a piece of candy what else can it do? After presenting our vision for how littleBits could use video games as a means of introducing kids to programming, the team from littleBits took our work back to their office to sell the rest of the company on the idea. After nearly 2 years of development littleBits released Code Kit: The first STEM learning kit to combine block-based programming with real-world engineering using littleBits electronic building blocks, empowering students to create their own games.